Leonardo Bruni, Commentarius de primo bello punico, translated into Italian. 200 x 150 mm. – 8+96+2 leaves. With 14 pen-and-wash drawings. The extended history of the First Punic War (264-241 BC) by the foremost humanist of the time enjoyed immediate success. Leonardo Bruni (c. 1370-1444) compiled his account to replace the lost second decade of Livy’s great Roman history. The Commentarius de bello Punico consists largely of a compilation from Books I and II by the Greek historian Polybius. He also drew on other sources and this, combined with his critical judgement, made him into ‘the first modern historian’. Bruni was also committed to the vernacular and arranged for the translation of the Punic War into Italian by an anonymous friend. The interesting drawings, mainly geographic or cartographic in nature, seem to reflect the personal interpretation by the copyist, John of Justinopolis (modern-day Koper, Capodistria). The fact that John did not work in Italy but across the Adriatic, in Zara (currently Zadar), may have induced him to add maps in order to better visualize the location of both inimical parties. John of Justinopolis delivered a manuscript not merely offering a locally framed narration but a wider lens on the cultural influence of Italian literature. 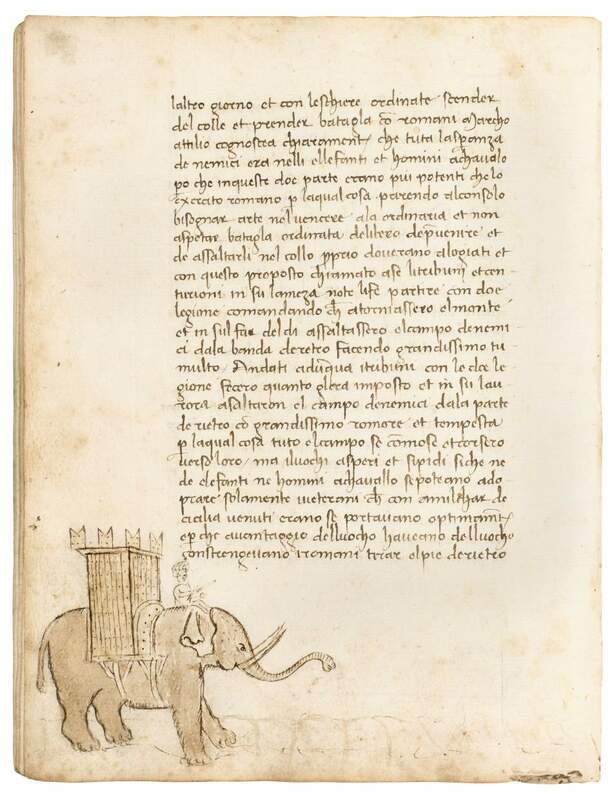 As hardly any manuscripts survive from towns controlled by the Venetian Empire such as Zara, this manuscript is of great importance.